The joy of a book is its timeless shareable quality. Owning a book is a pleasure, and lending or borrowing a book is also a great pleasure, whether from a friend or from an institution, like a public library. This makes a book the ultimate recyclable object: it can be read, sold, passed around, referred to, or even just left on the shelf until it is so worn it is unreadable, and then finally the paper can be added to the paper recycling process. The look and feel of a book can be such a beautiful thing, and many of us find it hard to conceive of losing a single book or a particular collection of books. Most towns and cities have a second-hand book shop, or a stall at a local market.Some will pay for your books, some offer part-cash/part-credit (so you can get more books! ),some shops may only take a few and give you the option of donating the rest. It is also possible to sell your books online – check out some of the websites of Internet booksellers for details. Offer them to your family and friends. Check to see if there are any Internet book exchange websites: this is a great way to pass on your old books and read some you have long wanted to read. Some Cities even have places where people leave books for others to take!See if there is an apartment building in your neighbourhood where the residents share there books by leaving them in the hallway. You could leave them in waiting rooms, bus shelters, etc, but be careful of littering public places – dumping is not recycling.donate them. 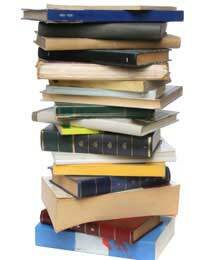 All second hand shops, run by well-known charities, will accept books, in good to reasonable quality. Some charities, such as Oxfam and Save The Children Fund, now have metal book banks in public places or at reclamation centres, where books can be safely deposited. Some charities also leave bags for household goods on doorsteps, and will return by arrangement to collect them. Libraries often appreciate donations of rarer books, or a collection of books on one theme. Schools and colleges often appreciate donations of books, particularly if they are relevant to the curriculum.give them as gifts. Everyone appreciates books, but it’s great to go out of your way and give a book about a particular subject to someone who you know who may particularly appreciate it. Ask if there are any book-swap schemes in your neighbourhood. If not, start one! If it is really not possible for you to do any of the above, then yes, a book can be added to a paper recycling bin. Check if the cover and spine are paper, card or plastic: they will usually have to be removed and dealt with separately.